Ladies (and gents)...got some good monetary news. No, I didn't land my dream writing job. And no, that dollar I put into a slot machine yesterday didn't change my life. But I will be getting paid for a story I wrote nearly two years ago for a local weekly entertainment newspaper. Sure, it doesn't make me feel a whole lot better about that previously mentioned, and guilt-inducing shopping spree I went on over the weekend. But I'll liken it to finding money in your pocket of a jacket from last winter. Totally forgot it was there, probably won't buy you those (insert coveted item here), but in the end, you can manage to buy your friends a few rounds of drinks. Emily, I believe I owe you one. And maybe some fries. Good fries. About the outfit though, I bought this tuxedo blazer from Express months ago, rocking it with my wet lame leggings/jeans/dresses but this marks the first time I tried it out with shorts. This also marks the first time I attempted cuffing the sleeves to show off the adorable leopard print that lines it. Needless to say, I don't know what took me so long to realize it was there. We've truly been missing out on each other. P.S. Picked up the most awesome vintage Christian Dior shirt for only $10 yesterday. Can't wait to show ya'll. I loves. I'm very jelous of people who can wear short shorts.....long heavy SIIIGGGHHH. Please follow my blog, I'll give you a cookie. Your blazer is AMAZING..I love the leopard lining! Can't wait to see that new dior shirt..cant believe it was only 10 dollars?! oh my gosh ur blazer is so amazing. im speechless and i love ur shorts.. u look FAB! I love that blazer! I sense a little DIY in my future! This is such a cute blazer. Good choice in cuffing up the sleeves and wearing it with shorts. Yay money! I'm still waiting to get paid from that class I taught and then I'll have magically appearing money too. I'm really digging this look, btw. The shorts and the jacket look great together. Hm.. ever thought of wearing the blazer inside out? I love blazers paired with shorts - and I the shorts are the perfect length! you have to show us the dior shirt! just perfect as always. 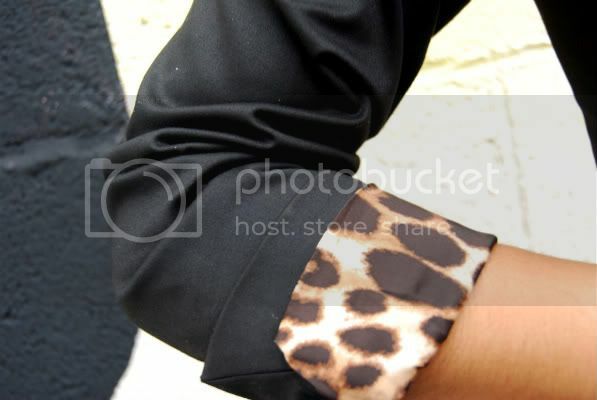 love the leopard at the cuffs of the blazer. I love the sneaky little flash of leopard print! And congrats on the story. I like your outfit. And the blazer is "trop mignon" and I love your shoes!! Amazing outfit, I love the details. love this entire llok, great clashing of the patterns and details of every piece!